Chavez’ political heir has revealed that the Venezuelan leader is to be embalmed and preserved just like Lenin, and laid out in the ‘Mountain Barracks’ where he devised a failed coup. The venue will be turned into a Museum of the Revolution. “We have decided to prepare the body of our Comandante President, to embalm it so that it remains open for all time for the people. Just like Ho Chi Minh. Just like Lenin. Just like Mao Zedong,” said Nicolas Maduro, the provisional president, on state TV. He is Chavez’s designated successor. Maduro also said that the former President will lie in state for seven more days, at a military museum, so that people can continue to pay their respects to the leader. 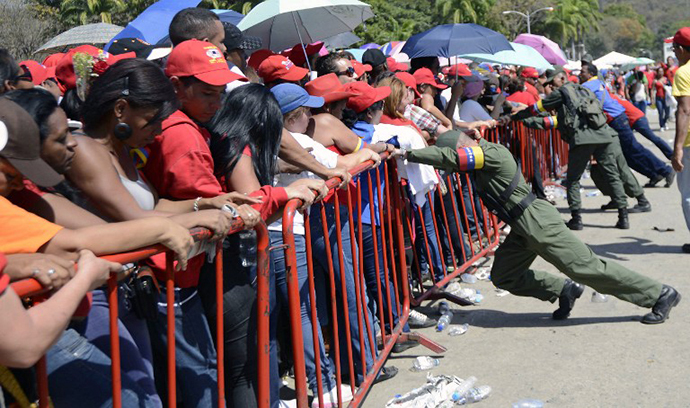 The farewell to Chavez was extended as mourners flocked to bid farewells at the military academy since Wednesday, where his glass-topped casket is currently on display. Inside the casket, the former leader was wearing olive green military dress, a black tie and his signature red beret. He had a red sash across his torso, with the word ‘militia’ on it – the name of the 120,000-strong force which he created. The government estimated the turnout figure to be around the 2 million mark in a country with a population of 29 million. Many kept a nighttime vigil. Chavez’s body was transported seven hour procession on Wednesday from the hospital where he died to its current resting place. The official funeral took place on Friday, but the announcement that he is to be embalmed has surprised many, only hours before it was planned to occur. Maduro said that the demand to see the deceased leader was far too great to ignore. A reported 55 heads of state or government are due to attend, which will include Iranian President Mahmoud Ahmadinejad. The service is still expected to go ahead in Caracas, the capital, to mark the transfer of Chavez’s body, prior to the embalming. The ‘Mountain Barracks’ are where Chavez arranged a failed coup against then-President Carlos Andres Perez on February 4, 1994. The slum was an area of concentrated Chavez support, and his arrest as a result of the planned coup turned him into a hero, resulting in election victory in 1998. Maduro implied that his move there may not be permanent. 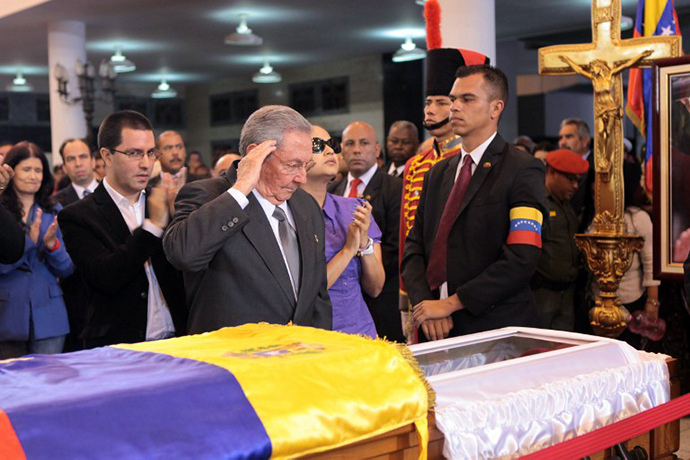 There is widespread support for Chavez to be taken to the national pantheon to lie alongside Simon Bolivar, the Latin American independence hero, in whose honor Chavez constructed the mausoleum. Сhavez often called himself a Bolivarian patriot, and ‘Revolutionary Bolivarian Movement-200’ was the name of the grouping which first attempted the coup. His socialist rule lasted for 14 years, and he played a pivotal role in re-nationalizing the oil industry. After a two-year battle with cancer, he died from a heart attack at the age of 58. “Chavez was a brave and very thorough man who was able to showcase strong character to go through with his plans. He genuinely wanted to rid the country’s poor citizens of their plight and improve their lives. Chavez became the symbol of independence throughout Latin America while he was still alive. He’s joined the legendary ranks of Simon Bolivar, Fidel Castro, and Che Guevara,” said Russian President Vladimir Putin. Fellow Latin American presidents also lauded the late president. “This liberation process, not only of the Venezuelan people, but also of all the Latin American peoples must continue,” said Bolivian President Evo Morales. “Chavez allowed us to restore faith in Latin America regions, so that a profound transformation in the region can be carried out,” said President Rafael Correa of Ecuador. Maduro will be sworn in as acting president on Friday, and will later call elections. The national electoral council will set the date for elections, which must take place within 30 days of the president’s death, according to the constitution. He will go head to head with opposition leader Henrique Capriles Radonski. However, Capriles lost to Chavez in October’s presidential polls. 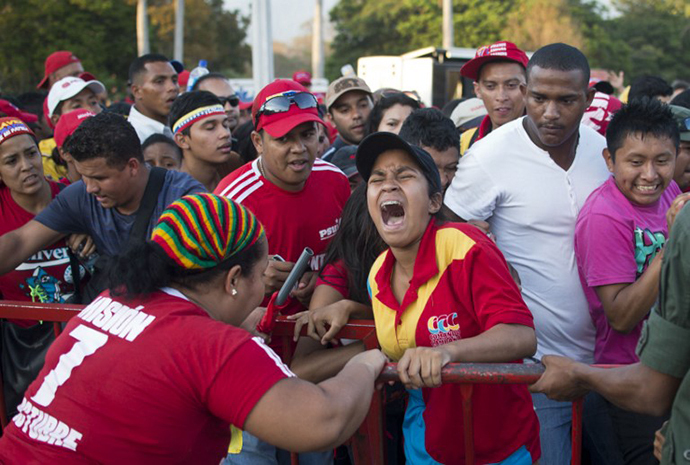 A further recent opinion poll has suggested that Chavez’s anointed successor, Maduro, is likely to with the election.